Muslims held a protest against “creeping Christmas” and the “Charlatan Santa” in Istanbul’s Maltepe Square this week. The Muslims were angry that a tree was decorated in the square. Crowd gathers to protest against growing influence of the ‘charlatan’ Santa, presents and Christmas trees in latest demonstrations in Istanbul. Despite the approach of Christmas and New Year, some Turks are definitely not in a festive mood. 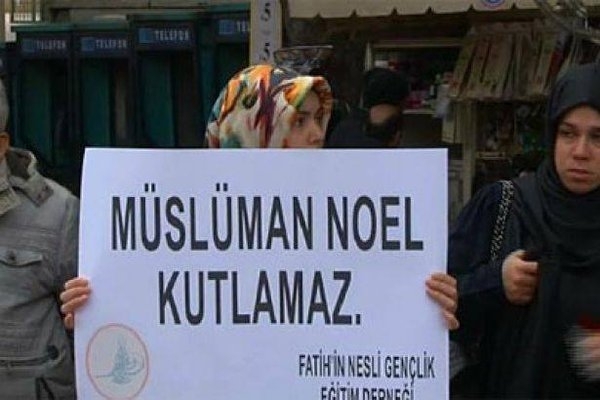 Protestors have gathered in Istanbul’s Maltepe Square holding up placards that read “Musluman noel kutlamaz” (Muslims do not celebrate Christmas) in protest at a Christmas tree in the square. According to local news sources, activists from the Fatih Generation Youth Education Association were angry that their “sensitivies” as Muslims were not being recognised. In 2013 protesters stabbed inflatable Santa at a protest in Istanbul.